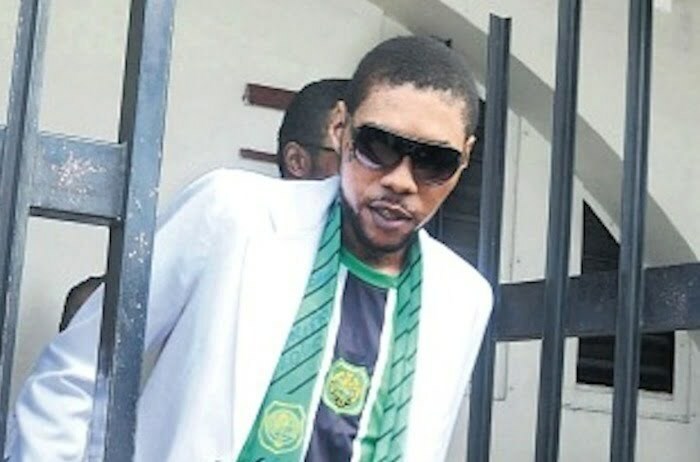 Today marks one year since Vybz Kartel and three others including his protege Shawn Storm were convicted of murdering Clive “Lizard” Williams. On March 13, 2014, an 11-member jury sent shock waves throughout the dancehall community when they returned a guilty verdict against the dancehall star, real name Adidja Palmer, as well as, his protege Shawn “Storm” Campbell, and close friends Kahira Jones and André St John. Another co-accused, Shane Williams, was exonerated of the murder charge. The highly publicized trial, which was dubbed the longest murder trial in Jamaica’s history, was not all smooth sailing. The case was marred by controversy including police tampering with evidence, witness intimidation, and juror corruption. The prosecution, headed by attorney Jeremy Taylor, took 46 days and 24 witnesses to build its case against the four men. The jury took just two hours to return a 10:1 guilty verdict. One member of the jury who voted not guilty was arrested and charged with conspiracy after he was allegedly paid off by the embattled dancehall deejay. Vybz Kartel, who was sentenced to life imprisonment, has maintained his innocence and has filed an appeal to overturn his conviction. Sources close to the former Portmore Empire deejay told Urban Islandz that he will continue his fight for freedom in the appeal court. “No we are not giving up and will go to the highest level of the court system to undo this case of injustice,” Urban Islandz source said. Our source also told us that the appeal has not yet been mentioned in the court and that could be a lengthy process. “The appeal court system in Jamaica is a really slow process so we still don’t have an approximate date when the case will be mentioned,” our source said. A year later what is Vybz Kartel doing? A year after his shocking conviction, Vybz Kartel is still dominating dancehall airwaves both locally and overseas. The deejay’s management is still releasing a slew of new music on a regular basis and even a new album VIKING: Vybz Is King, out now. Two of the incarcerated deejay’s sons, Little Vybz and Little Addi, have also taken on a career in dancehall music. They two have been releasing new music under Kartel’s wife new label Short Boss Music. Vybz Kartel and Shawn Storm were also recently the target of another prison inmate who was plotting the kill the “Dancehall Hero” deejay. Authorities uncovered the murder plot when they found knives and poison in a section of the prison. A correctional worker was also implicated in the murder plot. Check out these Vybz Kartel photos.